Color Guard has two separate seasons. All rehearsals are outside of the school day. Each semester counts as an elective towards the PE credit through the school district. The fall semester Color Guard performs with the Marching Band program. This season lasts from August until early November. The Winter Guard season competes indoors and counts as the spring semester credit. This season lasts from December until early April. Is high school Color Guard difficult? Just like anything worth your time, being in the SHS Color Guard takes effort. However, we have a spot for ALL students, regardless of your current level. Our biggest wish is for all students to achieve consistently and enjoy the learning process. Every aspect of our program is designed to foster and encourage musical and personal maturity. Can I play other sports/extra-curricular activities? YES! In fact, most of our students are involved in sports or other co-curricular activities. We encourage you to participate in a variety of co-curricular activities. No mater what activities you pursue, you must keep an accurate schedule and iron out any conflicts that may arise. We have a systematic approach to help you with this, but it is up to you to keep your schedule straight, for the good of the group and for the good of your other activities. With a little give and take, most things work out just fine. We have students involved in every sport on campus. Additionally, any college or university in the country will attest to the fact that the busiest students are the most successful students. Again, structure and discipline work! Does Color Guard take up all my time? No! This is perhaps the greatest misconception to incoming students and parents. Color Guard is a commitment, just like anything of worth, but does not prevent you from participation in other SHS classes, activities, and co-curriculars. Further, no other organization on campus has a greater success rate of everything from GPA to college placement. Structure and discipline work! Does Color Guard look good on college applications? ABSOLUTELY! In fact, most college admissions departments seek out music students, as they recognize all that is involved in our academic discipline. Our graduates are attending some of the top universities and colleges in the country. Every year, the music office phone rings with questions from college admissions departments regarding our students. Most of our students stand out when compared to non-music students, and every year we have graduates earning scholarships based on their music participation and academic merit. Yes! In the Fall, the Color Guard travels with the marching band to various shows and competitions. At least one or two weekend trips occur in the fall season. The Winter Guard travels to shows on Saturdays and takes at least one overnight trip per year. These are a great time to hang out with your new Color Guard friends. For example in 2012, the Winter Guard traveled to a Regional Performance in San Diego! What is the typical commitment outside of the school day? During the fall marching band season (September-first week November), we have most of our rehearsals outside of the regular school day. These events are built into the curriculum, and are considered the “homework,” similar to any other class. However, we do spend significantly LESS time outside of the school day than our competitor schools. Therefore, we expect maximum effort and commitment to our schedule, with conflicts to be worked out as specified. Wednesday Evening Full Ensemble - Full Ensemble Rehearsals occur from 5:30 - 9 PM. Is it possible to take Color Guard with Band/Orch./Choir? Yes! 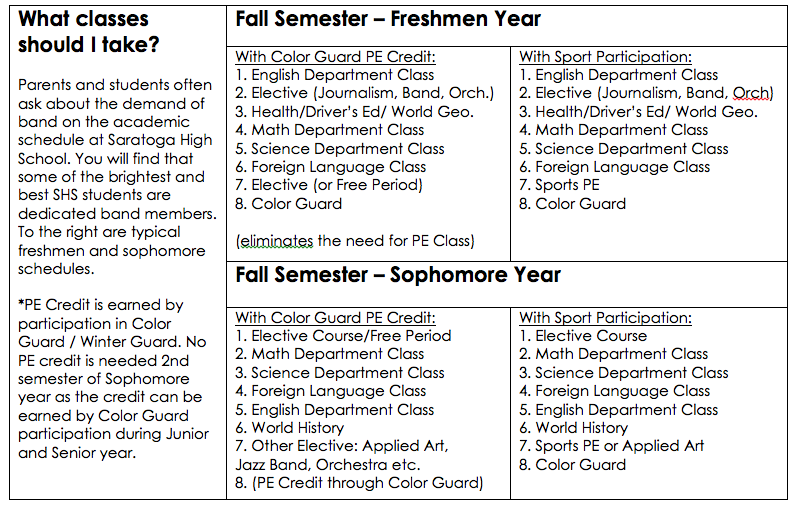 We have many students who play an instrument or sing in choir, but want to earn their PE credit through performance in Color Guard. Performances! Practice! Color Guard is a group performance class. Performance situations can’t be recreated around each individual student. These growth experiences occur infrequently and are very important to the development of the student. Since we depend on each other so much, it is a great loss to miss anyone, and therefore all performances are required. The contribution of each student is critical and irreplaceable. You will receive a performance schedule well in advance. If changes occur in the schedule, you will be notified immediately. Many of our Color Guard students take dance lessons privately, but this is not a requirement of the course. Each year, new students with no prior dance or movement experience join the Color Guard program. With the instruction of our staff and the help of student leaders, you will learn everything you need about Color Guard within the program. Does the school provide Equipment and Uniforms? Yes, just about everything uniform and equipment related is provided for students. What are ways parents can get involved with the Color Guard? The most important thing parents can do to fully support students is providing the ingredients for success in all academic endeavors. In music, some of these are: dance lessons, praise and encouragement, patient ears, and most importantly, attend all events and performances. The Guard program relies heavily on parent volunteers for many things. Becoming a member of the music boosters and volunteering when available is greatly appreciated. In general, Guard students are fun and inspirational group of young people, fun to be around. Our volunteer parents have a wonderful time volunteering with our students, and many oftentimes become great friends!